Today this technique has been abandoned and is only used very rarely. In retinal detachment, the reliability and efficacy provided by posterior vitrectomy techniques, sometimes combined with scleral surgery, are much higher and there's a lower rate of repeated detachment. 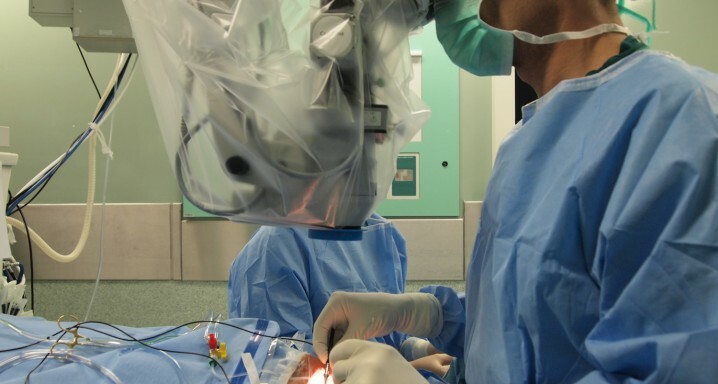 Pneumatic retinopexy is a surgical procedure to correct retinal detachment. This treatment consists of injecting a small amount of a gas specific to a certain concentration within the vitreous cavity. Over the first few hours, this bubble of gas expands inside the eye, allowing the retina to be reapplied and the break to be treated that has caused the detachment via laser photocoagulation. After the procedure, the patient's head needs to be kept in a certain position for several days for the gas to fulfil its function. Patients are advised not to go to places at a high altitude for several weeks, or make any plane journeys as any reduction in air pressure could produce and uncontrolled expansion of the bubble, which would lead to complications. After a few weeks, the gas is reabsorbed spontaneously and the retina is sealed.